1. Preheat oven to 180 degrees Celsius. Line muffin pans with patty cases. 2. Using an electric mixer, beat butter and sugar until light and fluffy, scraping the sides and bottom of the bowl as needed. Beat in the eggs, one at a time and beat in the vanilla until just combined (mixture will look curdled at this stage). Add the flour and milk in alternate batches and beat until combined. Always remember to start your mixer on low speed when adding ingredients, or you’ll get flour everywhere! 3. Divide mixture evenly among the prepared cups (I used a large ice-cream scoop and it is the perfect measurement for the large patty cases). Bake for 15-20 minutes or until a skewer inserted in the centres comes out clean. Transfer pans to a wire rack to cool for 5 minutes. 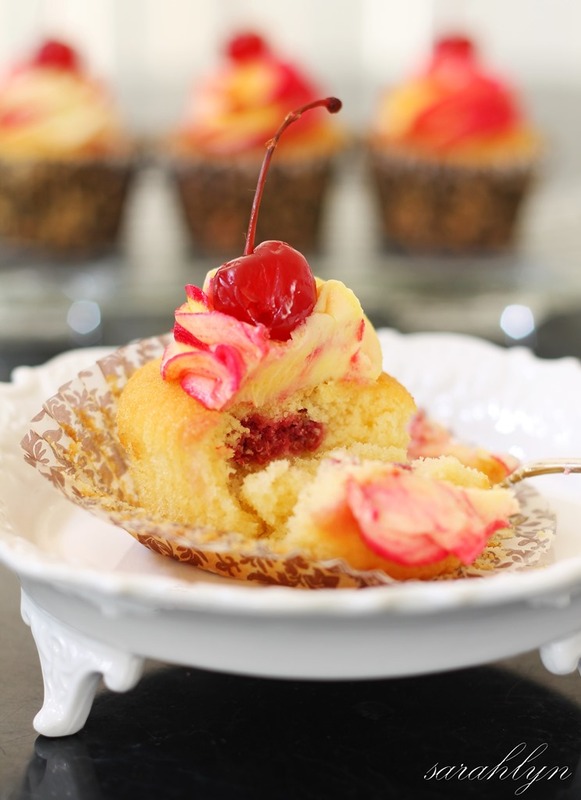 Remove cupcakes from pan and cool completely. 4. To make the coulis, combine raspberries, sugar and water in a small saucepan. Bring to the boil, while mashing with a wooden spoon. Simmer for one minute on low. Place raspberries in a food processor and process until smooth. Use a spoon to press puree through a sieve into a bowl. Discard seeds. Place in the fridge until required. 5. Use an apple corer to cut holes in the cupcakes – but don’t go all the way through (you can use a small knife if you don’t have an apple corer). 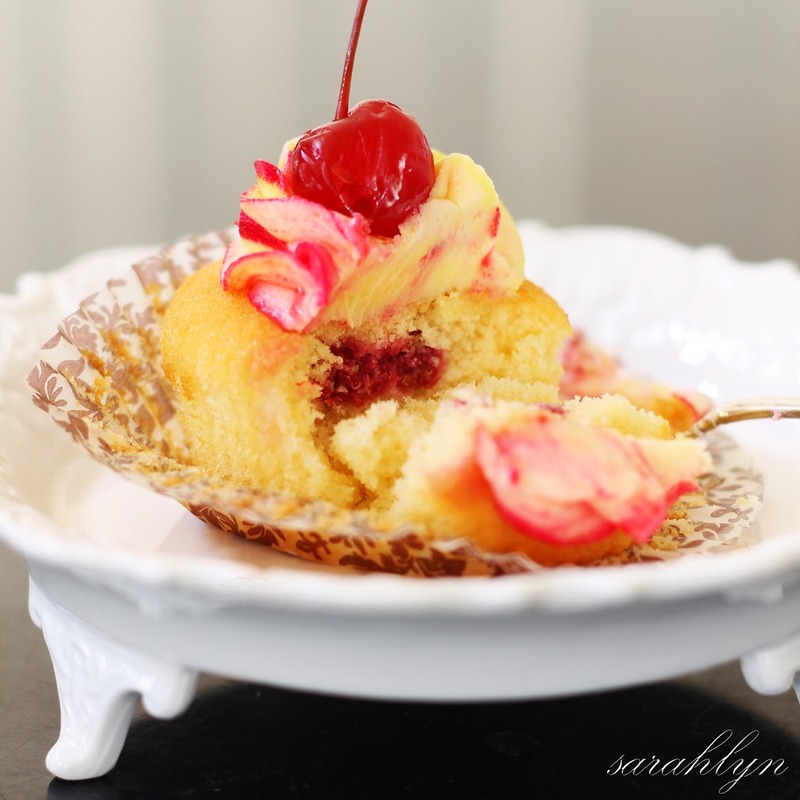 Spoon coulis in the center of each cupcake. Top with a small piece of cake that was cut out. 6. Using an electric mixer, beat butter in a bowl until pale and fluffy. Gradually add icing sugar and milk, beating constantly until combined. Place in the fridge until required. 7. To achieve the swirl, carefully squeeze a few drops of red food gel down the side of the piping bag and use a skewer to spread it down in a line. Sprinkle a few drops of yellow food coloring on the buttercream mixture and mix slightly. 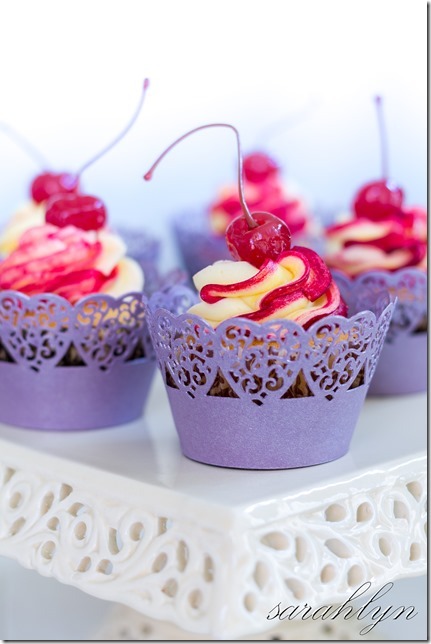 Put the frosting in a piping bag fitted with your desired nozzle and pipe on top of cupcakes. Decorate with maraschino cherries or fresh raspberries.